Sir R. H. Williams Bulkeley, Bart. 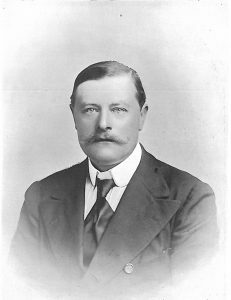 Sir Richard was born in London in 1862, and educated at Eton. For twenty-five years he has been prominently connected with yachting in this country, and one of the most enthusiastic in furthering the sport. He is, moreover, a practical sportsman. Of the score of yachts owned by Sir Richard at one time or other, perhaps the most notable was Britannia, which he purchased from King Edward imme­diately before his accession. Though in Sir Richard’s possession for but one year, he raced her for the King’s Cup. Her spars were reduced before the race, but she seemed to have lost none of her form. As a cruiser His Majesty was pleased with his old and famous craft, and repurchased her. Other famous yachts in the list were: Aphrodite, 240 tons, schooner ; Carmen, 210 tons, s.y. ; Zingara, 560 tons, s.y. ; Kriemhilda, 100 tons, the famous racer ; Speranza, 450 tons ; Lizette, 116 tons, which he built ; Skipjack, 89 tons ; Vagus, ex-Wanderer, 700 tons, which he afterwards sold to Lord Crawford ; and Taurus, 570 tons, With these yachts he has sailed in most of the cruising waters of the world, and has always commanded and navigated his own ships. 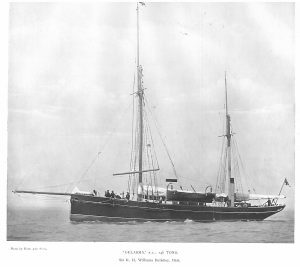 Sir Richard now owns Forsa, 35-ton yawl, designed by A. Mylne and built by J. Reid and Co., of Glasgow ; and the Gelasma, s.y., built by Gibbs and Co. for him. In social and public life Sir Richard has shown great activity. He is a member of the Life­boat Institution, and for several years was cox­swain of one of the boats ; he commanded the Liverpool Brigade of the Royal Naval Artillery Volunteers, and has just vacated command of the Royal Anglesey R.E. Militia. Sir Richard is also Lord Lieutenant of the County of Anglesey and Chairman of the Quarter Sessions, and was Master of the Anglesey Harriers for four years. He is also Commodore of the Royal Anglesey Yacht Club, which he founded some years ago. Clubs:R.Y.S., Royal Anglesey, Royal St. George, Royal Welsh. Residence: Baron Hill, Beaumaris, North Wales.